There’s this funny thing about being a United States president—You don’t have to provide evidence for anything. Obviously this has escaped journalists as they continually deride President Trump and I can’t help but wonder; has the press forgotten that a sitting U.S. president has top secret access to information they don’t? Essentially, Trump now knows if Area 51 exists or not. So, it should be an unquestionable fact that he or any other U.S. president not only doesn’t have to explain to anyone where he or she got the information, but that said president’s veracity shouldn’t be called into question just because proof wasn’t given to the uninformed press. Interestingly enough, the media acts as though they’re entitled to proof from Donald Trump. Of course, when he doesn’t provide it he’s called a liar for his egregious sin by people who routinely report half truths and outright fabrications. I wonder if it would be more acceptable to media pundits if Trump followed up each of his tweets with the statement, “an anonymous source close to the matter speaking to me on condition of anonymity told me so.” If I had to venture a guess I’d say probably not, and it would be absolutely ridiculous if the POTUS did so. Though, considering the office he now occupies, it’s reasonable to presume that if Trump fell into the baits of the media goading him into proving the veracity of his own statements it could potentially jeopardize national security. Naturally we can’t address this subject without mentioning the presidential tweets, and their shortcomings. Literally, Twitter tweets are short and there isn’t a lot of room for the president to pack much information into each one. The media should consider this when requiring President Trump to cite his sources on a platform where a statement is confined to 280 characters. But, here is the real meat and potatoes of my point. Sometimes it’s obvious that Trump gathers his regularly tweeted content from the national news room echo chamber on the conservatively angled side of journalism. Most of the time however, he makes statements which we are given zero information on where his information came from. Consequently we have to wait for months as information trickles out which can then be snapped into place like solving an information jigsaw puzzle. Ultimately, Trump has access to advisers who regularly give him unsanitized briefings of what’s going on in the government which he presides over. Simply put, the President has information the rest of us don’t. His position grants him the knowledge that comes with unredacted intel packets. When he tweets something, all the proof that should be needed is that he’s the President of the United States. Take for example Trump’s August 28th tweet stating that China hacked Hillary Clinton’s server. 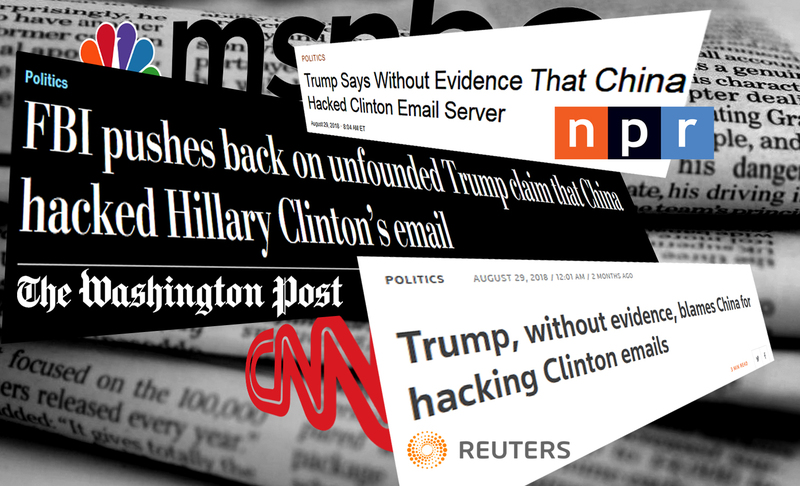 The national news machine churned out almost identical Trump disreputing headlines so voraciously and in such high volume, that any opposing view was effectively buried online. Months after his tweet, Trump was vindicated yet again. It was publicly leaked that in 2015 the ICIG discovered a Chinese hack embedded in Hillary Clinton’s server, producing and forwarding a copy of classified documents to a Washington D.C. based Chinese tech firm. A tech firm which is known to the Intel community as a Chinese state actor. All along the president was correct and the press had unfairly derided him. Unsurprisingly this report isn’t being echoed for months on end. But, the reason the media keeps being trumped is because they continually act like they know more about what’s going on in the government. Due to the aforementioned reasons, this is an incredibly foolish position for the press to take. They’re repeatedly setting themselves up for a fall. Especially considering the president can easily go around them and speak directly to the people through his Twitter account. The reality is, the main stream News media has not forgotten that the President knows things they don’t. They simply hate the fact that this particular President—who thoroughly embarrassed them by trashing all their prognostications—has access to classified information and they do not. ← WELCOME TO THE PACKET!